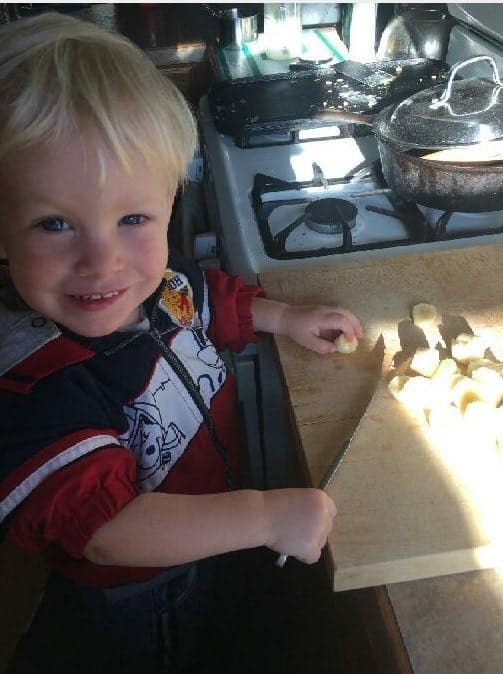 How early can you start teaching your kids to cook? It’s almost never too early to build good food habits and get kids involved in the kitchen. 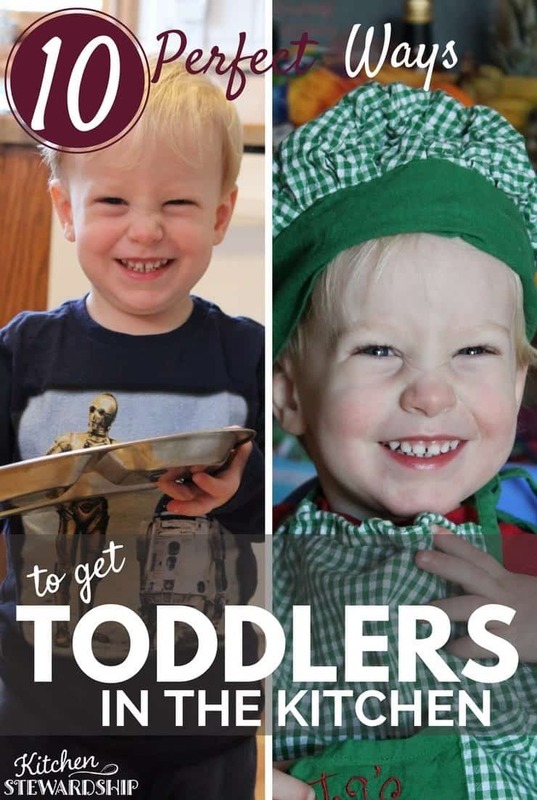 My sweet, joyful toddler who always smiled at everything had a transformation this month. He literally turned into a stubborn human being with OPINIONS right before our eyes! Nonetheless, it’s too late to take him back. We know it’s just a phase, but there are some strategies to cut down on meltdowns. One of my favorites is to give the child meaningful work and choices throughout the day. This both builds independence as we work to raise high-quality adults AND acts as insurance, a “filling the bucket” so to speak to try to prevent tantrums before they even start. It’s not always easy to do in the midst of busy life, but my head knows it’s worth it – so I try. I wear my babies in the kitchen right from birth, so they’re immediately surrounded by the sights, sounds and smells of cooking. But once they start walking around and getting into things, it can be tough to find the balance between what you can let them “help” with and shooing them out of your way. How much mess are you willing to put up with? That’s going to happen no matter what unless you lock every cupboard, but there are more intentional ways to keep kids involved in cooking without giving them free license to do whatever they want. So what do you do FIRST of all? First, just don’t give up. Don’t shoo them out. There’s always something they can do at every age. 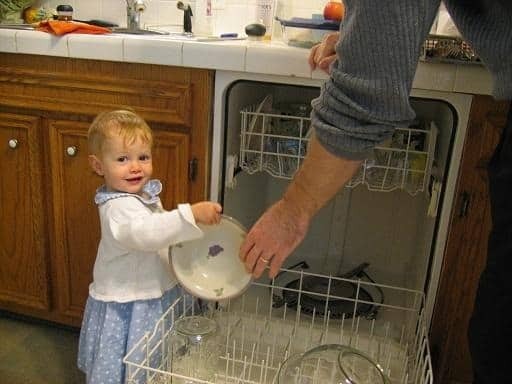 Which means that the FIRST thing to do with toddlers in the kitchen is to direct your attitude toward success. Believe that they can contribute, and you’ll find a way. If they don’t eat it, we keep presenting it. You’ll hear more about this next week in an interview about picky eating, but we even had a breakthrough with my 5-year-old last week on a food that he’s avoided and hated for YEARS! When kids are most hungry – just as you’re preparing dinner – is a great time to get them to try something new, and if they feel important because Mommy needs them to taste something for the family, all the better. And if they refuse to taste – form the Smelling Committee and pull down some extra spices for them to treat their olfactory senses to. 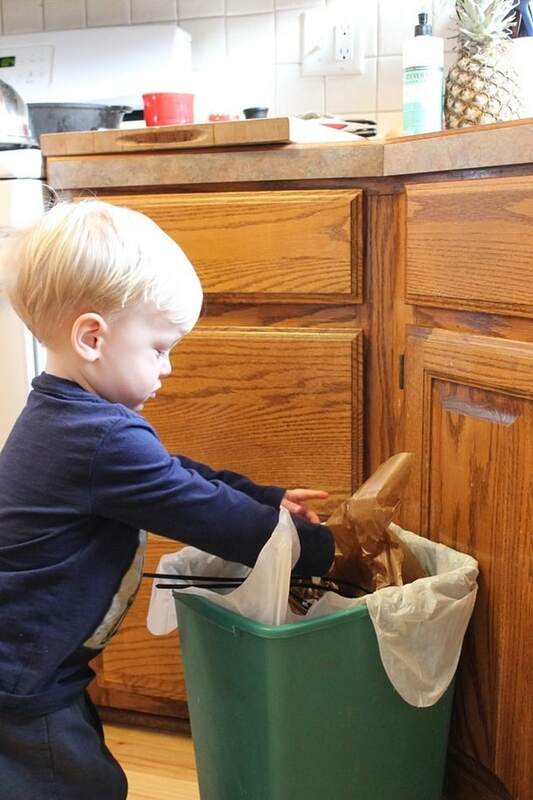 I might call this “garbage duty” or just “helping Mommy” depending on the age of the child (some need more motivation from a cool phrase), but basically if I’m peeling onions, oranges, potatoes, whatever – I just hand each peel to the tiny person at my knees and they throw them away. It’s repetitive (kids love that), it’s practical (I love that) and it only slows me down a tiny bit. There’s not much margin for error, yet the child is having fun and most importantly, involved. 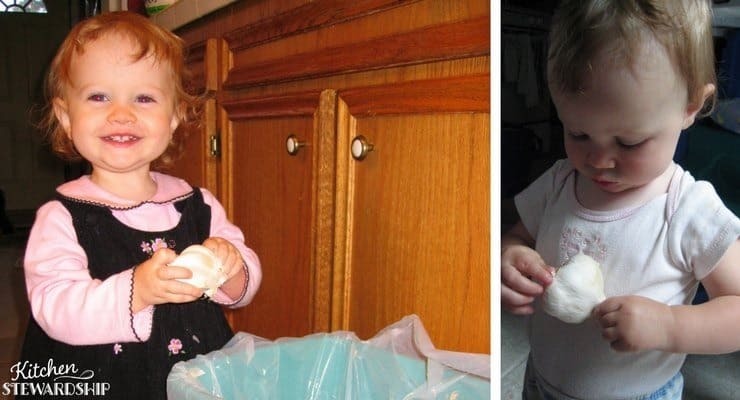 As long as your toddler won’t eat all the papery peels, give them a bulb of garlic and let them go to town. It’s busy-work and they might not last forever, but if you can’t think of anything else, it’s at least something real to give them. And may I just stop and mention how similar Leah (pictured above at 18 mos. and 13 mos.) looks to Gabe at this age?! He’s a little mini-Leah with platinum hair! The worst that can happen is a fork goes in where the spoons belong, right? One-year-olds: Start by handing them one utensil at a time. You might even point to where it goes – it’s just a game, time well spent together. 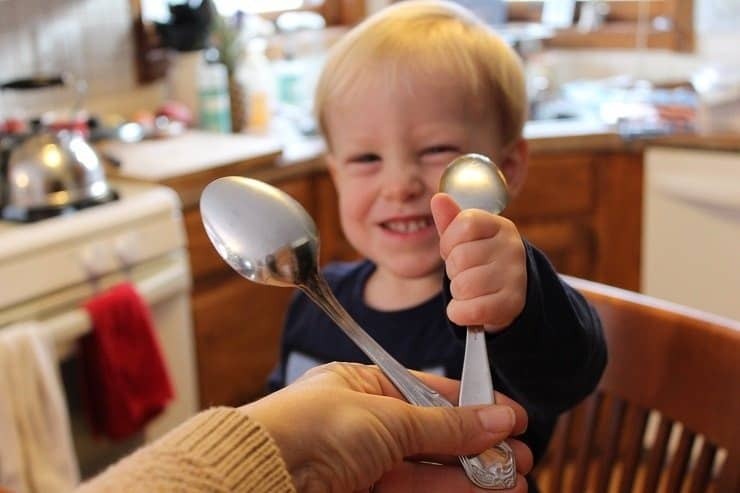 18-month-olds: Try holding up two different items, like a fork and a spoon, then ask them to take one of them. See if they can grab the right one by following your vocal commands. Then work on finding the “match” in the drawer so they know where to put it. You’re still giving plenty of help, likely, although some 18-month-olds can sort nearly by themselves. The best part about this one is that it can truly become an independent activity rather quickly, with genuine contribution to the family! I encourage you to let your little one help with this job as soon as they show interest, even if it makes you cringe to think of what they might drop! 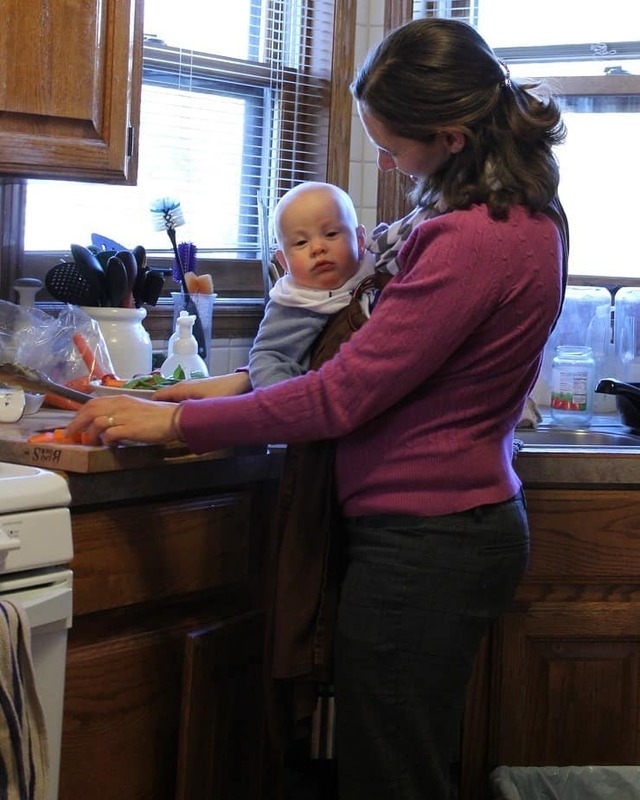 They can hand you each dish like Leah is doing in the photo – the toddler’s hand is only in charge of the item for a few inches, and there’s not far to fall. You can keep your hands underneath as they carry items. You can ask them to open the cupboards and drawers for YOU to put things away that belong down low. They can make a stack of same-sized small plates or bowls right on the open door of the dishwasher (so not far to go). If something does break (in our house the adults are more likely to break dishes than the kids most times! ), just clean it up after getting the child out of harm’s way, and then back off. Tell the child that they need a break from unloading the dishwasher, and if it was their fault for being rambunctious and not just an accident, they should have to prove to you that they can be calm before earning the responsibility again. Teaching kids how to carry plates may not sound like a skill that needs to be taught, but it totally is! Carrying something completely level is not an instinct. 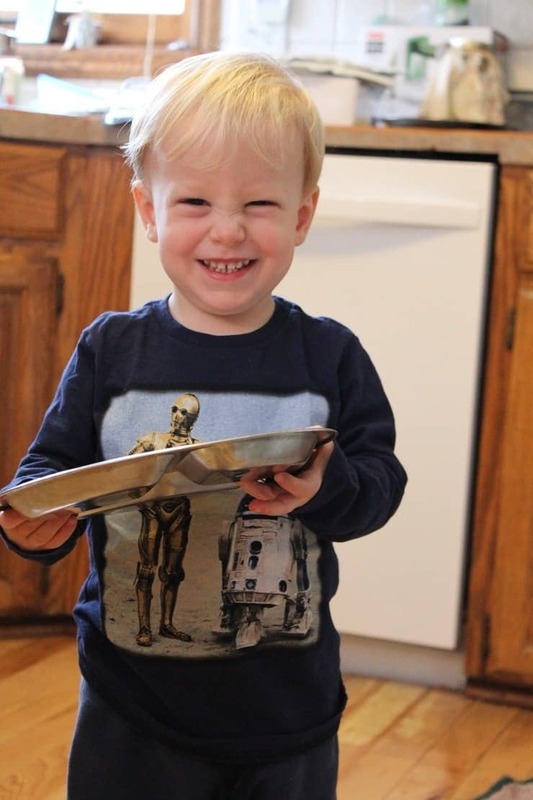 Tell your child to hold a plate with two hands, thumbs on top (that’s key! You’ll see why) and guide them as they walk to the table. When they’re too short to see the top of the table, you’ll have to help them set the plate down as it’s really too much to ask them to put something above their heads and keep it level! 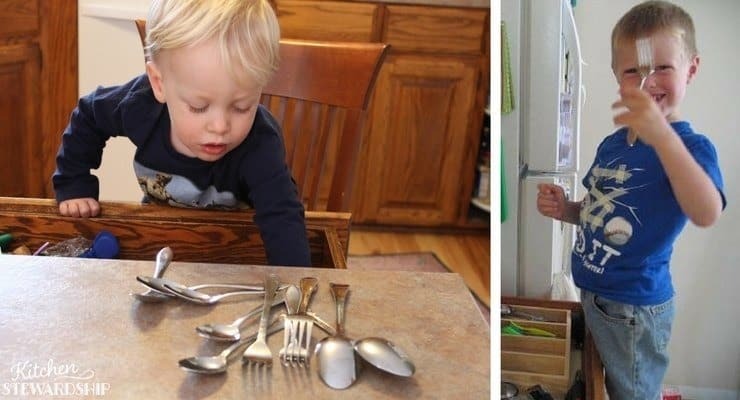 But practice makes perfect, and I guarantee you’ll be happy you took the time to do it when your 2-year-old can genuinely help set and clear the table. I couldn’t ask my 2-year-old to set the table on his own, but carrying things around and setting them down has pretty much been his full-time job for a year now, so if I can direct that activity a little bit, I’m all for it! I’ll give a tiny tot one utensil at a time and just have them run it to the table and come back. They can even set it on a chair if they can’t safely reach the table top. I won’t give 1-and-2-year-olds breakable plates or filled drinking glasses in the midst of a crazy family dinner prep, BUT if my daughter is on the job, she’ll guide him with just about anything. Love that girl. Anything in plastic is fair game though! A bag of carrots, a box of feta cheese, or a tub of sour cream made into homemade ranch dressing are just perfect to keep little hands full and little feet running purposefully back and forth. It’s totally possible to give a 2-year-old (and even younger) a knife! 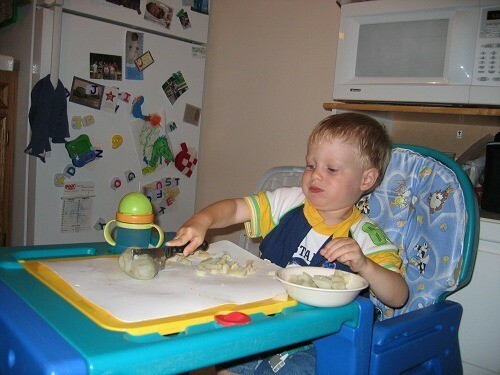 I hope we can encourage you to get your kids in the kitchen from a very early age! Kids can often do more than you think they can handle, but we never know unless we give them a chance. This is Gabe pouring dry rice from cup to cup, inside a tub so spills don’t matter. Dry beans are great for pouring (and exploring) practice too. Sometimes we’ll be very intentional about it and show him how to pour back and forth. Other times we throw some dry beans in a big bowl on a tray, give him a few measuring cups, and let him explore so we can get something done! They’re going to get in your cupboards, y’all. It’s inevitable. Might as well embrace it and make it educational instead of just a mess! How could I leave out this little cutie, our no. 3 child, John? He had a thing for my glass jars, which are an incredibly convenient height for toddlers and on a pull-out shelf to boot. 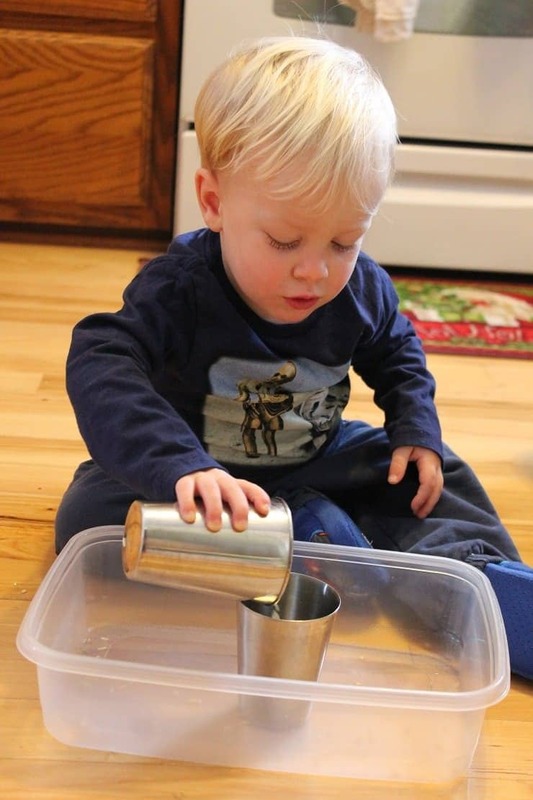 He learned a lot about matching sizes, and honed his fine motor skills from practicing twisting lids! 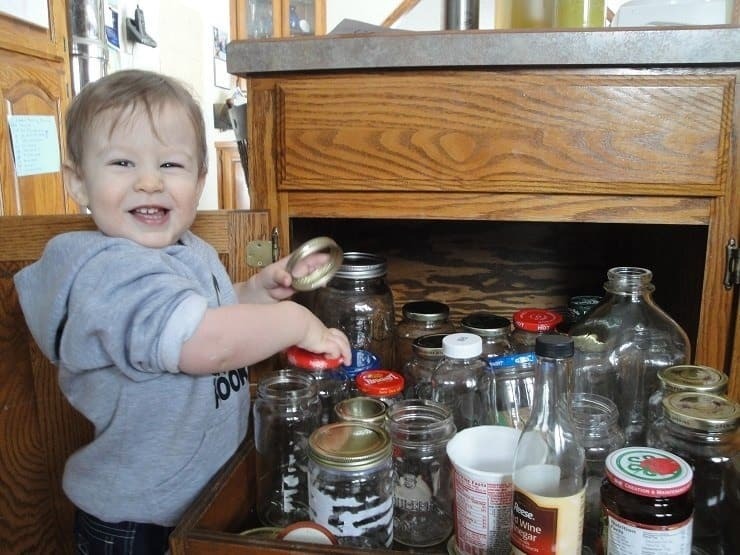 He also peppered our house with jar lids and I could never find one when I needed it. He also learned to be careful with heavy, breakable things, which wouldn’t have happened if I locked this cupboard and only let him into the plastics. 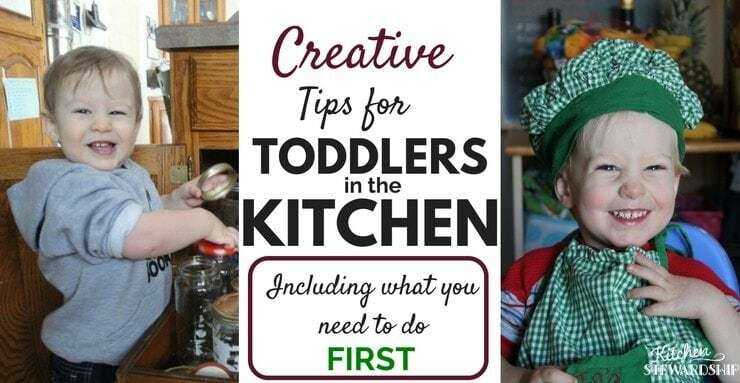 What Else Can Toddlers Do in the Kitchen? What do you love to have your tiny tots help with? Our video-based kids cooking lessons inside the Kids Cook Real Food eCourse reach all age groups!